You are capable of far more than you know. Don’t be afraid to unleash your greatness. Pooh Bear once said “when you see someone putting on his big boots, you can be pretty sure an adventure is about to happen”. Adventures are sure to happen when we look at our life and realize that some changes need to be made. Sometimes we see something in the distance that we want to explore. Sometimes, like Alice, we fall into the adventure with no expectations of what we will find. We all have these dreams and aspirations that get buried under “to do” lists. We check off daily house cleaning chores, grocery shopping, taking kids to sport or music programs, taking care of elderly parents and the list of duties and obligations go on and on. We get so lost in the “I have to’s” that the “I want to’s” disappear. You are made of so much beauty, but it seems that you forgot when you decided you were defined by all the things you’re not. What sometimes happens is that we start perpetuating and growing the list of responsibilities because we start hiding behind the reasons and excuses of not having enough time to work on dusting off the dream and working to bring it into reality. Can you think of at least one dream, that you have put on the “someday” list? For years I told myself that I didn’t have the time to write. I had a fulltime job that entailed lots of overtime, four kids to raise and a husband to take care of. Where in all of that was time to find a quiet space to write? So I told myself, when the kids grow up, then I would write. Well the kids grew up and still there was a large list of reasons why I didn’t have the time. What was really happening is that I was terrified that I didn’t have anything worthwhile to say. That you would read what I wrote and laugh your head off, or even worse stop reading after the first paragraph and I would just hear the sound of silence or boredom. I think that Facebook was the thing that started me dipping my toes in the water. I would find a quote I liked and do a paragraph or two about the quote on my personal page, and it stayed small because Facebook limited me to the number of words. I would spend more time cutting out words than it took me to write it. Anyway friends and family liked the post (which I thought meant they were just being nice) and then something interesting happened. They started complaining when I wasn’t posting anything. There is nothing more beautiful than finding your course as you believe you bob aimlessly in the current. And wouldn’t you know that your path was there all along, waiting for you to knock, waiting for you to become. This path does not belong to your parents, your teachers, your leaders, or your lovers. Your path is your character defining itself more and more every day. Then Facebook took away the word limit and they grew a little larger. Then I started this LemonadeMaker page. I started creating my quotes on a photo and expanding the writing a little more. And before I realized what was happening you showed up and not only liked my post, you commented on it and shared it with your friends. You even liked the page. I started believing in myself, because you helped me to build the confidence to believe in myself. That is what I believe is true of all of us. We are all BRAVER than we believe we are. I put my thoughts out and what I found is I can have a conversation about them and you may or may not agree with me, and that is ok. I discovered that I could survive differences of opinion. In fact I discovered that I could grow on the difference of opinion. While we all have different experiences in life, there is a core of everyone’s experience that is the same. It is that difference that makes the variety that we all need in life. Difference isn’t a scary thing was a major reveal for me. We are all STRONGER than we think we are. We are all SMARTER than we think we are. All successful people, men and women are big dreamers. They imagine what their future could be, ideal in every respect, and then they work every day toward their distant vision, that goal or purpose. I have a different way of looking at the world. I love to find multiple meanings in words. I think that words are like colors and have these shades of color waiting to be explored. It gives each word depth and height and width. As people we have these hidden sides to us. When you look at the stories of those who go through fiery experiences in their lives you see what they learn about themselves and others. It gives new meaning to what humanity is all about. Don’t be the reason someone feels insecure. Be the reason someone feels seen, heard, and supported by the whole universe. I am so glad that I take the chance each day to express my thoughts, as those thoughts are creating a community of souls that I believe are filled with simply amazing people – and yes that means you! You encourage me each day to express my thoughts and I hope in turn that I can encourage just one person each day that life is not only worth living – but that we are all brave enough and strong enough to climb to the tops of mountains, and explore the depths of valleys and swim in the oceans. If you want to go deeper into the conversation, make a comment below. Go to our website and sign up for the next free webinar. 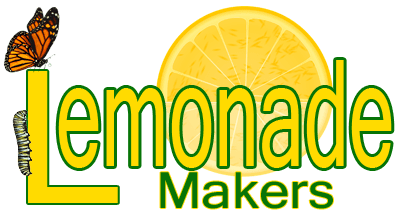 Check out our LemonadeMakers Club. Choose your happiness. Happiness is a choice, so choose to let go of things that frustrate you and start to enjoy your life.